What Foods Do You Eat to Build Cartilage in Your Knees? Cartilage acts like a pad or cushion, protecting your bones at the joints during movement. In older adults and younger people who are very physically active, like athletes, cartilage may start to break down and become less cushiony over time. This can lead to friction and pain, especially in well-used joints like the knees -- a condition known as osteoarthritis. Your doctor may recommend pain relievers, supplements or surgery in extreme cases, but your diet can also help you manage your condition and even build new cartilage. The University of Maryland Medical Center recommends an anti-inflammatory diet to help prevent and manage osteoarthritis. For this diet, boost consumption of fresh vegetables and fruits, whole grains, legumes, lean protein from poultry and cold-water fish, and healthy fats from olive oil, nuts, seeds and avocado. 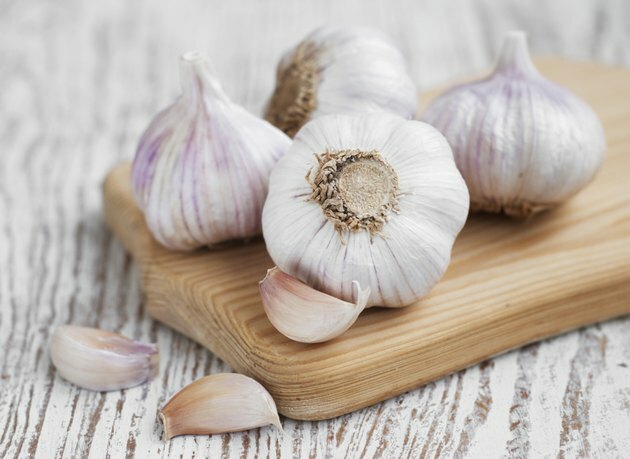 In particular, UMMC suggests garlic, onions, parsley, watercress, celery and lemon for their anti-inflammatory potential. Your joints require water to remain lubricated, so UMMC recommends getting six to eight glasses a day. In following this type of diet, you may also lose weight -- a plus, because obesity is a major risk factor for osteoarthritis. Cartilage is made of collagen, and your body requires vitamin C to make this protein. To build cartilage in your knees, make sure you are getting the recommended daily amount of this antioxidant vitamin -- 75 milligrams for women and 90 milligrams for men. You can get vitamin C from most fruits and many vegetables, especially citrus fruits, kiwi, berries, sweet peppers, cruciferous veggies like broccoli and cauliflower, and leafy greens. While it doesn’t build new tissue, vitamin D can help you preserve the cartilage you have, reports registered dietitian Joy Bauer -- you need at least 600 international units daily. Get your vitamin D from fatty fish, dairy foods, eggs, soy milk, UV-treated mushrooms and fortified foods. Glycine and proline are the most abundant amino acids in your tissues' collagen fibers, according to the Weston A. Price Foundation. While your body can manufacture these proteins -- meaning you don’t have to get them from food -- a low-protein diet may create a deficit, leading to joint problems. Glycine and proline are abundant in gelatin, a food substance derived from animal collagen. The WAP Foundation recommends incorporating rich bone broths into your diet through soups, stews and sauces to build cartilage. You can make your own joint-supporting meat stock by simmering the bones of your choice with water, vegetables and herbs. Certain foods can create inflammation in the body, fueling your joint pain while doing nothing to help you build new tissue. In addition to incorporating healthy carbs, fats and proteins into your diet, Bauer recommends avoiding refined carbohydrates in foods such as white flour foods, white rice, and sugary foods and beverages. Foods high in saturated fats, like fatty meats and full-fat dairy, can also lead to an inflammatory state, as can trans fats found in food like french fries and commercial baked goods.